Although it's great to have a pretty planner full of gorgeous stickers, it's also much more important to have said planner working in your favor. Your planner needs to be a helpful companion that encourages you to tick things of the to do list, rather than be a distraction from tasks. Lately I've been working on how to set realistic cleaning and chore goals in my planner. Here are a few of my tips and tricks. The most obvious tip, plan ahead. Sure it may seem like it would go hand and hand with planning, but that's not always the case when it comes to scheduling chores. This is very helpful with tasks that may slip your mind or aren't as frequent as other chores. Things like cleaning underneath the refrigerator or changing out filters. 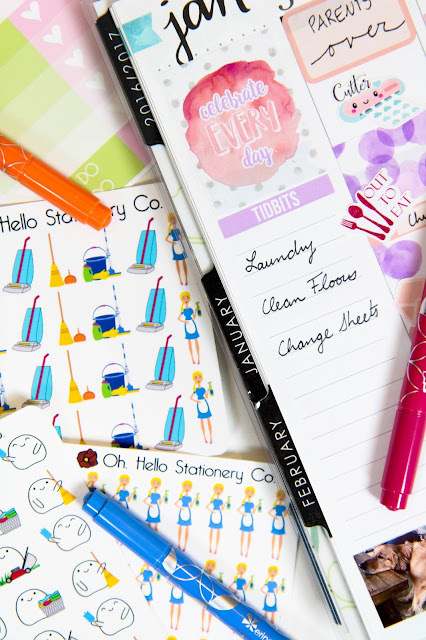 Mark them ahead of time in your planner based on cleaning recommendations. So when every six months roll around you're already prepared. Spread out the tasks that occur weekly so they don't all pile up on one day during the week. That way if something happens to come up on a particular day, things seem a lot more manageable than having to move an entire laundry list of things you have to clean and do. Set a routine so you know what to expect every week. Maybe on Mondays you do laundry and on Fridays you vacuum the house. Figure out a weekly chore schedule that fits well around the other tasks in your life so you're actually able to accomplish some of them. Once you have your routine and have planned ahead for less frequent activities use stickers to create a clear, uniform system. Use the same sticker type every week so when you flip open your planner you're able to see that same symbol week after week. If you're constantly changing up how your chore list looks or where it's located, you're more likely to forget something. Give yourself a catch up day every few months. Pick one day every three months or so that you keep clear of any responsibilities. Use this day to catch up on all those things you put off. Hang the gallery wall you've had all the supplies for, file the mountain of paperwork, or wash the windows. Any time you think of something you want to do but don't feel like you have time for, add it to the catch up day list. When that day rolls around on your calendar free of any other activities, you have the perfect opportunity to finally get them done. So pull out your planner, start planning ahead, and get back on top of your chores and cleaning schedule. Now I'm off to do the dishes! What are some of your tips and tricks for setting realistic cleaning and chore goals?